Product Claims: The perfect product for two strand twist and other natural hairstyles. It has the right amount of moisture and hold. Also great for anyone who loves the scent of chocolate, coffee/mocha. Note: Now has a true cream like consistency. Ingredients: Theobroma Cacao (Cocoa) Seed Butter, Distilled Aqua(Water), Aloe Vera Whole Leaf Juice (Certified Organic), Cellulose, Citric Acid, Althaea officinalis (Marshmallow Root), Extract, Oryza Sativa(Rice Bran)Oil, Persea gratissima (Avocado)Oil, Ricinus communis (Castor)Oil, Emulsifying Wax NF, Equisetum hyemale (Horsetail) Extract, Fragrance, Potassium Sorbate, and Coconut Oil. Thoughts: This is now one of my favorite products for defined braid outs. It has a creamy consistency and applies with slip, which is a bit rare for a cream styler. CBTC provides hold without the crunch or dryness of a gel. I typically use it alone and seal my ends with an oil. The hold lasts all day with minimal swelling/frizzing. The fragrance is that of cocoa butter...like Palmer's Cocoa Butter. Not a fan of that, but the scent fades so I don't mind it much. I would like it more if the fragrance was more chocolate-y, but I guess I can't always have dessert-scented products. One thing to note, when I received this, the jar was only filled three-fourths of the way. I think Audra, the owner, offered a $2 refund or something like that, but I really would have much rather just received my product full from the beginning. If I order an 8oz, I want to receive an 8oz. The other products were full to the rim so I'm not certain why the mishap occurred. One superficial con with this product line, the labels are taped on, which isn't the best when styling on wet hair or using oil-based products. 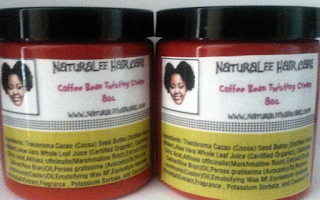 Naturalee Hair Care is available online. CBTC is available in 8oz sizes for $12. Would I repurchase? Yes. Multiples.